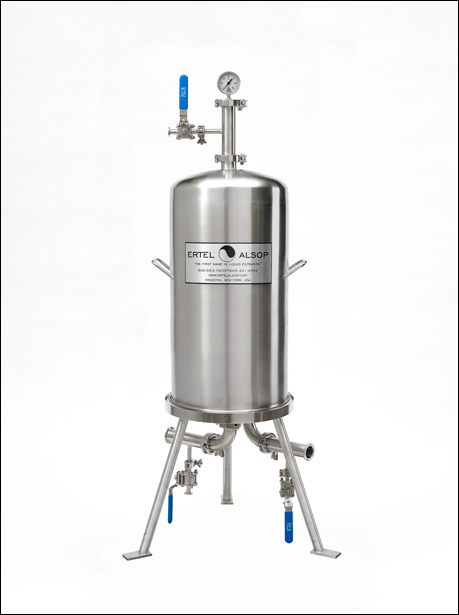 The ErtelAlsop domed filter housing, the Double O-Ring Pak System consists of our highly polished stainless steel Domed Filter Housing used in conjunction with our Zeta-Pak double o-ring lenticular filter cartridge. Our simple quarter-turn lock, and static core structure of the ErtelAlsop filter element eliminates the concerns of misalignment or sealing between flat gasket cartridge style systems. The typical housing can hold up to four 12-inch or 16-inch diameter Pak filter cartridges in a vertical configuration. **All dimensions are for reference only.